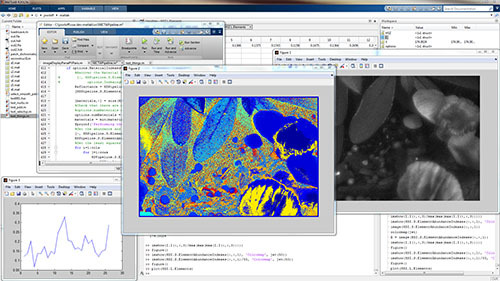 The Scyllarus MATLAB® Toolbox is aimed at supporting research into Hyperspectral and Multispectral image processing. Scyllarus is implemented separately in this Toolbox to that of the C++ API, it is more comprehensive and provides features that cannot be found in the C++ API. It represents the bleeding edge of our research into spectral technologies at NICTA. Support for reading and writing ENVI standard header files. Can be used to store Illuminant spectra, material reflectance spectra, sensitivity functions, etc. The following methods are supported. Extensive in-line documentation is available within the package. You can also view the documentation online. Scyllarus has been tested on versions of MATLAB® from 2011a onwards. Download size is ~10MB. * Items use MEX and are currently Windows x64 only. If you make use of the Scyllarus MATLAB® toolbox for your research, please cite the relevant papers as indicated within the documentation. Buchsbaum, G. (1980). A spatial processor model for object colour perception. Journal of the Franklin Institute, 310(1), 337–350. Finlayson, G. D., & Schaefer, G. (2001). Solving for colour constancy using a constrained dichromatic reflection model. International Journal of Computer Vision, 42(3), 127–144. Gu, L., Robles-Kelly, A., & Zhou, J. (2013). Efficient Estimation of Reflectance Parameters from Imaging Spectroscopy. IEEE Transactions on Image Processing, 22(9), 3648 – 3663. Huynh, C. P., & Robles-Kelly, A. (2010). A Solution of the Dichromatic Model for Multispectral Photometric Invariance. International Journal of Computer Vision, 90(1), 1-27. McCann, J. J., Hall, J. A., & Land, E. H. (1977). Color mondrian experiments: the study of average spectral distributions. Journal of the Optical Society of America A, 67, 1380. Tan, R. T., & Ikeuchi, K. (2005). Separating Reflection Components of Textured Surfaces from a Single Image. IEEE Transactions on Pattern Analysis and Machine Intelligence, 27(2), 178-193.
van de Weijer, J., Gevers, T., & Gijsenij, A. (2007). Edge-based color constancy. IEEE Transactions on Image Processing, 16(9), 2207–2214.